During my pregnancy, I had a lot of sacroiliac joint pain and pubic symphysis pain. Fortunately it wasn't debilitating, but it definitely got my attention and forced me to move slowly some days. After my daughter was born, I developed sneeze pee. I didn't think much of it, I just assumed it went along with motherhood. It was actually more than just sneeze pee. It was laugh pee, cough pee, move too fast pee, hurry up, you-have-to-go-to-the-bathroom-NOW pee. When my daughter was 4 months old, I experienced my first full fledged back spasm. And in case I thought that was a fluke, it happened again at 6 months. What did all of these symptoms have in common? They were all red flags that things were not well with my pelvis. These symptoms let me know that I lacked both mobility and stability throughout my body and as a result something had to give. Actually, a few things had to give. In my Freedom From Kegels online course, we spend time assessing strength and mobility gaps and doing various corrective exercises to bridge those gaps. What's a gap? It's where your strength and mobility are in this moment compared to where they need to be to support the function and health of your body. During the course, we also spend time looking at the day in, day out movement habits that add up over the years and create those strength and mobility gaps. Both the corrective exercises and the habit shifts are necessary for long-term improvement. You can do exercises to bridge the gaps day after day, but if you don't address the habits that are creating the need for the exercises, you're taking 2 steps forward and 1 step back and wondering why you aren't making more progress. Many of these habits are things we've been doing them for so long we aren't even we do them until we start to pay attention. If I ask you to relax your abdomen, chances are you'll realize that you hold a lot of tension there. Tension that you weren't aware of until I asked you to relax. Holding your stomach in day in and day out to reduce the appearance of your belly? That's a movement habit, and it's one that will interfere with your pelvic floor working well. I'm going to share with you two habits I had that helped set me up for challenges with my pelvis. These two habits originated in my feet, a reminder that pelvis issues, just like any body issue, are a whole body issues. Does this body position look familiar? Let's take a look at some specifics. First, notice that both of my feet are turned out, but not equally. My right leg is a lot more turned out than my left. Next, notice that my left leg is doing a lot more work to support my body weight compared to my right leg. You can also see that my weight is dropped a bit into my left hip. What does this mean? It means that the left and right sides of my body, because of the asymmetrical turn out and weight distribution side to side, are experiencing very different forces being placed upon them. I visited this position day after day, year after year and my muscles (and joints) adapted to this it. Adaptation meant that some of my muscles lost mobility, some of them were overworked and others went AWOL. This developed into a sort of pelvis tug of war every time I moved. Add a growing baby into the mix and it became a recipe for sacroiliac joint problems and pubic symphysis pain. Now I stand with the outside edges of my feet straight and my weight evenly distributed between them. This, along with different corrective exercises, helps balance the mobility and strength in those muscles. Once upon a time, I was a ballet dancer. I lived and breathed it for about 8 years and quickly learned to walk just like the professional dancers I looked up to - like a duck, with my feet turned out. Even when I stopped dancing, the habit of walking with my feet turned out remained. This image tells me that sooner, rather than later, I was going to have problems. 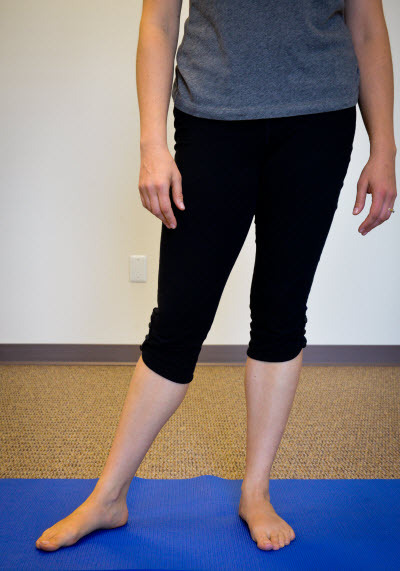 Walking with my feet turned out all the time meant that my deep hip rotators were in a shortened position which created less mobility in my hip joints. This habit also meant that the muscles on the outside of my hips - my lateral hip muscles - weren't being asked to do much of anything. Without regular use, those muscles became too weak to help stabilize my pelvis. Without a stable pelvis, my spine and pelvic floor muscles didn't have the support they needed to function well. This set me up for back spasms and sneeze pee. I learned to walk with straight feet and practiced keeping my feet the same distance as my pelvis. This meant my lateral hip muscles had to start helping out, which gave them lots of opportunity to get stronger. When I stopped walking with my feet turned out, widened my stance and gave up the habit of slouching into my left hip, I began to get relief from the symptoms these habits set me up for. Of course, there was more work to be done and there were more habits to shift, but just those simple changes were incredibly helpful for starting me on the road to recovery. In the next blog post, you'll get a chance to assess your lateral hip strength. You'll also learn what you can do to strengthen those muscles just in case you discover they're weak. If you'd like help with bridging your strength and mobility gaps and shifting the habits that create them, check out my online course Freedom From Kegels: A Whole Body Approach To A Pelvic Floor That Works. Get the benefit of learning in a structured environment with lots of support.